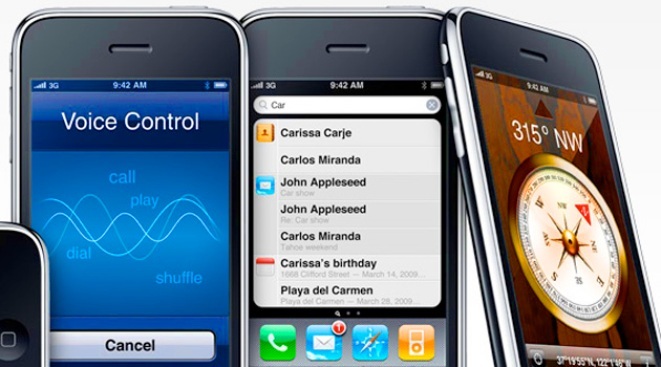 Apple today introduced the new iPhone 3G S, featuring improved speed and performance—up to twice as fast as iPhone 3G—longer battery life, a high-quality 3 megapixel autofocus camera, easy to use video recording and hands free voice control. The waiting, the drama, and mercifully, the speculation is ending. The Apple faithful -- iPhone app creators, Mac addicts, and the Apple-obsessed media -- have gathered in San Francisco's Moscone West convention center for the company's keynote kickoff to this year's World Wide Developer's Conference. The biggest news: There's a new iPhone, the 3G S, which lets people record, edit, and share video. Three models range from $99 to $299, and are available June 19. The new phone has a tap-to-focus feature as well. CEO Steve Jobs, who some hoped would stage an appearance, was a no-show. Apple has said they expect him to end a six-month medical leave at the end of the month. Jobs had announced in January that he was suffering from unspecified "hormone deficiencies" that had caused him to lose an alarming amount of weight. Jobs was treated for pancreatic cancer in 2004. The absence of Jobs could be read as a sign of confidence that Palm's new Pre won't make a dent in Apple's smartphone sales. Apple marketing exec Phil Schiller, the goofy Sancho Panza to Jobs's Quixote, showed off a new version of Apple's 15-inch MacBook Pro as well as the new video iPhones. When Apple brings out the second-stringers to show off new gear, you can tell they're feeling cocky. Scott Budman tweeted the WWDC keynote live on Twitter at @nbcbayareacom.